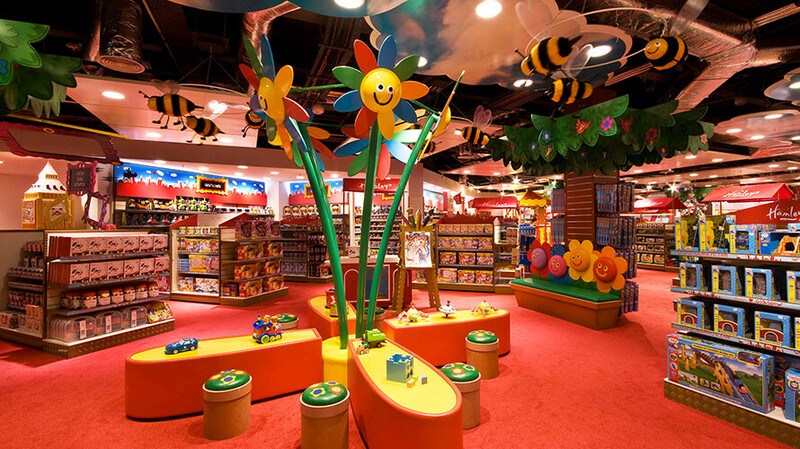 Peek inside our Hamleys store! How much is the entrance fee to Hamleys? Nothing! The entrance fee to the world of never-ending fun is entirely free of charge. Only some attractions at Hamleys must be paid for. All you need to do to enjoy them too is to top up your Hamleys Card at the cashier’s desk and then the fun can finally begin! How to pay for attractions and how much are they? The prices of attractions vary. Plenty of them is completely free of charge (for instance the Snake Slide, the Tree House, etc.) and for some of them, you must pay. The prices are CZK 25 (Excavators, Racing Cars), CZK 50 (the Venice Carousel) or CZK 100 (Virtual Reality, the Maze). Some of the attractions (e.g. the Butterfly House Papilonia) have different admission fees for children, students and adults. You can pay for the attractions with our special Hamleys Card which you can get and top up at the cashier’s desk. When you enter the attraction, the certain amount of credit will be taken away through the chip. Hamleys Prague doesn’t have its own parking space. Nevertheless, it is possible to park your car in the chargeable zones at the adjacent streets (Jindřišská street, Senovážná street, Hybernská street), alternatively at the guarded car park in Palladium shopping centre. Yes, we accept Euros at Hamleys. The current exchange rate is always available at the cashier’s desk. Can I enter Hamleys with a dog? Unfortunately, due to safety reasons and with respect to the children, it is possible to enter Hamleys only with small dogs. If you carry your dog in your arms or if the dog is inside the pet carrier, it is possible to enter the store. There is an exception for assistance dogs which are of course allowed to enter with no limits. Yes, it is possible to buy gift vouchers at the cashier’s desk. Is there any locker room at Hamleys? Unfortunately, there is no locker room at Hamleys yet. However, you can put your clothes in the red bags which are available to take at the entrance. Yes! The disabled customers are more than welcome at our store and we will do our best to make their visit as comfortable as possible. At the main entrance in Na Příkopě street, there is a ramp for wheelchair users. The wheelchair entrance is also in Panská street where you can ring the bell to call the staff who will gladly assist you. What are the steps for warranty claims and complaints? You can claim the warranty at the information stand right behind the Venice carousel. The receipt is, of course, needed. Can I take a picture with the bear? Of course! Our bears Hamley and Hattie are always available for you. All you have to do is ‘catch’ them somewhere in the store! Can my little child enter the attractions? Each attraction is different and recommended for children of different ages. There is a list of rules placed in front of each attraction where you can see for how old is the attraction accessible. Can I enter Hamleys with a pram? Yes, of course. At the entrance to Hamleys, there is a ramp, so even the youngest customers are welcome! Are there any refreshments available at Hamleys? Yes. On the 1st floor, you can find a coffee shop where you can order some refreshments, relax and still have supervision over your children. Is there any official Hamleys e-shop? Hamleys doesn’t have its own e-shop yet but you can find many of our toys at our ‘allied’ e-store Alza.cz under our very own bookmark.